Since formation at the turn of the Century the Bridgwater Labour Party has been the leading political force in the town with the strong backing from Trades Unions in what is essentially a traditional working class community. During the 19th and early 20th century the town swung backward and forward between Tory and Liberal with little difference between them. By the 1920s Labour had entered the contest and were neck and neck with the Liberals. In 1938 both parties stood down to support Independent Popular Front candidate Vernon Bartlett who took the seat from the Tories and kept it from them until 1951 when he retired from politics. From the 1950s the Tories kept the Bridgwater seat in Parliament (the constituency stretched across Exmoor to the Devon border and therefore included a vast expanse of rural Somerset) with Labour in a close second place almost providing upsets in the late 50s and early 60s. From the 40s onwards the Labour party ran the Borough council with a strong and disciplined majority only to be smashed by the Tory reforms of 1973 when Bridgwaters ancient Borough status was ended and the town submerged into the new Tory controlled Sedgemoor-which included Tory parishes stretching up to Burnham and Cheddar. During the 1980s the Labour partys move to the left was accompanied by right wingers splitting off to form the SDP and joining up with the Liberals-who ultimately didnt want them as they had been increasing in their own popularity during the 70s. By 1983 the SDP/Liberals had overtaken Labour as 2nd party in the Bridgwater Constituency and also started winning seats on Council. 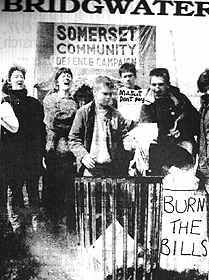 During the mid 80s the Bridgwater Labour Party supported the Miners strike and the anti-nuclear policy of the party nationally with members working in co-operation with non-party socialists helping to organise May Day rallies, solidarity campaigns , collecting food for striking Welsh miners and sending members to support the Wapping picket lines against Rupert Murdoch. 1987 was a disastrous year for Labour as old party stalwarts rejected the anti-nuclear policies and stood under the banner of Traditional Labour against the official party splitting the Labour vote and reducing the representation to its lowest ever. The late 80s saw the party moving back to the centre ground of Politics with a spate of resignations from the party by some left wing councillors and members claiming the Party was abandoning Socialism. 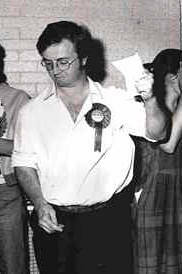 The Anti Poll Tax campaign from 1989 saw the election of Brian Smedley as Sedgemoor councillor on a Labour party ticket but with an active public role in the Anti Poll Tax Union. 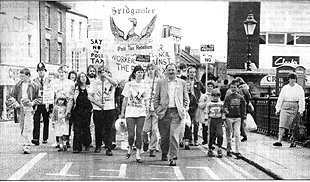 In 1990 Left winger Ken Livingstone visited Bridgwater as guest of the Anti-Poll Tax Union and led a march through the town. In 1991 support for the Labour Party increased as hatred of the Tories and particularly their Poll tax saw the number of Labour seats treble from 4 to 12. Labour councillors included Czech/Slovak friendship society Chairman Mac McCausland and secretary Brian Smedley. In 1995 the Labour and Liberal council seats outnumbered the Tories by one and a deal was struck allowing a Lib/Lab arrangement to control the Council with a sharing out of Committee chairs to keep the Tories out. In 1999 disaster struck the Liberals who were wiped out in the May election from 12 down to 2 seats and although the Labour representation went up-regaining traditional heartlands lost since the 1970s-such as Highbridge-the Tories retook Sedgemoor. Also this time will be the first BRIDGWATER TOWN COUNCIL elections for over 30 years!!! The Labour Parliamentary Candidate for the last general election was Cllr Bill Monteith who led the succesful campaign against the county liberals schemes to merge Sedgemoor manor schools recently. Bill is a computer expert and a rock drummer and vocalist in recent years and was a long standing rail worker and qualified ferry driver. The election was the closest yet with long standing Tory incumbant Tom King finally standing down and in a 3-cornered fight the new Tory Ian Liddel Grainger (359th in line to the throne apparently) winning the local liberals tried to convince people as usual that they had the best chance of winning here but they havent so far as they cant crack the working class bedrock of Bridgwater. In fact every year since the early 80s Labour has clawed back more and more votes and with a good candidate could eventually take the seat!! !